A special feature of this print is the ornamental frame in the form of a jōruri theatre script on the upper right. It shows an actor as a toy seller. A figure of the Amida Buddha (goraigō), made of paper, wood or clay, was placed in a bamboo pipe. When the pipe is pulled down – as can be seen in this scene – a halo of yellow paper opens up in front of the figure. The notable characteristic of this woodblock print is the cartouche in the form of a script copy (nukihon) in the upper right-hand corner; this is a script for the third act of the theatre play Hakata Tsuyuzaemon iro denju (Hakata Tsuyuzaemon- “Initiation into the Secrets of Love”) for the puppet stage. The protagonist- here shown to the left and identified on his breast by the character tsuyu (rope) from his name- appears in this scene as the seller of goraigô. This was the name given to a kind of toy which enjoyed great popularity during the Genroku Period (1688-1704), which was offered for sale by street-traders. A little image of Buddha made of paper, wood or clay was stuck on a bamboo cane; when the rod was pulled down- as can be seen in this print- a halo made of paper opened up to display the image in front. The clothing of Hakata Tsuyuzaemon, who here appears equipped with a rich assortment of wares, shows the “Seven Chinese Wise Men in a Bamboo Grove,” designed as details on a folding screen. 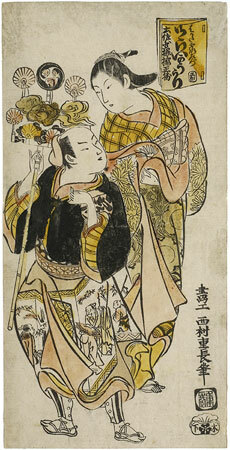 The woman at his side, in a kimono patterned with chrysanthemum blossoms and stylized hand drums, wears a sash-belt fastened at the front in the manner of courtesans. The aforementioned cartouche also provides us with the information that this scene is from a puppet stage play composed and presented by Tosa-no-shôjô Tachibana-no-Masakatsu (II,?-1741/11); in addition the publisher’s seal, possibly seiri, can be read. The narrator represented the school of tosabushi, a refined stylistic trend of the ningyô (puppet) jôruri, the Japanese puppet theatre in Edo, now Tôkyô, which was popular there from about 1670. Unfortunately, little source material is available about the puppet theatre in Edo, so it is not possible to determine when and on which stage the performance was given. The puppet theatre, which started in about 1600 in Kyôto, was made up of a combination of the three elements: puppet theatre, chanting, and shamisen (lute) accompaniment, which were all performed simultaneously; their precise integration created the puppet theatre ensemble. The narrator, called the tayû, is the leading figure in the performance, whom the puppet players follow. He functions not only as the narrator of the text, describing and commenting on the action, but he also delivers the whole dialogue. With his script on a black lacquered pulpit in front of him, he usually sits together with the shamisen players on a raised platform to the right of the stage. The puppets were at first manipulated by one player, but from 1700 puppets manipulated by three players became the norm. This represented a synthesis of hand puppets and marionettes, whose strings and attachments for manipulation were moved to the inside of the puppet figures. The second player guided the left arm, while the third was responsible for moving the feet. During the play, the upper part of the puppet players’ bodies could be seen above a balustrade at half height. The woodblock was published by Kinoshita, Jin’emon, who is known as a publisher of puppet theatre scripts (seal in lower right-hand corner); three further prints by him are known, identified by the cartouche in the form of a nukihon script and illustrating protagonists from puppet theatre scenes narrated by Tosa-no-shôjô Tachibana-no-Masakatsu. These were also created by Nishimura Shigenaga. It can be assumed that the publisher of the nukihon script in which Hakata Tsuyuzaemon appears, published this woodblock print at the same time and used it for advertising purposes. Possibly Shigenaga also illustrated the shôhon script for this stage play.